Indian two-wheeler industry is a vast market with huge opportunities for almost every manufacturer with different category vehicles. Among all, the scooter segment is picking up rapidly and especially the 125cc scooter segment that is witnessing the arrival of newcomers every day. Lately, the 125cc scooter segment which already has prominent options like the Honda Grazia and the TVS NTorq, gets a maxi styled scooter named as the Suzuki Burgman Street 125. All three of these products are flagship models for their manufacturers. Here we are going to compare them to major aspects listed below to find out how will they perform competitively. Apparently, all the three scooters have their own style statement. 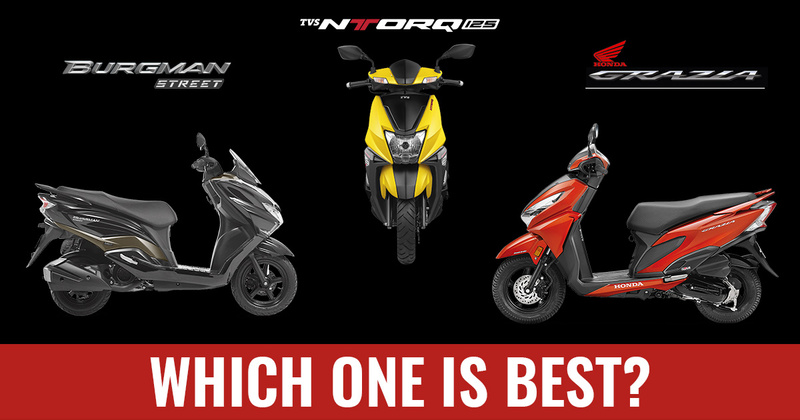 Let’s start with the TVS NTorq which has a comparatively least busy design of all, seems inspired by the Honda Dio. other than the aesthetic bits such as stylish LED tail lamp, split grab rails, sticker jobs and obviously the dual tone colour make it a desirable, good-looking offering for the audience. Next, in a queue, the Honda Grazia drapes a more intense design philosophy with edgier lines across the length. In addition to this, large headlamp and tail lamp setup with associated turn indicators split grab rail and dual tone shade alike the NTorq are the major highlights of the Grazia. In the field of onboard features, all the three scooter are loaded with cutting-edge technological features. The LED headlamp which is common equipment in newcomers is being offered with the Suzuki Burgman Street 125 and the Grazia as headlamp along with position lights. The Ntorq, on the other hand, gets standard halogen lamps with DRLs. Only the Burgman Street has LED taillamp. Whereas, the Grazia and the Ntorq come fitted with standard units. The instrument cluster on the Burgman and the Grazia is an all-digital unit. Whereas, the Ntorq receives the ‘Smartxonnet’ infotainment system which offers facilities such as Bluetooth connectivity, navigation assist, last parked location assist, caller id, ride stats with Sport and Street modes, etc. The Suzuki Burgman Street 125 rides on 12-inch front and 10-inch rear wheel which come shod up with tubeless tyres. It gets suspended on the telescopic fork up front and the Hydraulic type shock absorbers at the rear. Where the stopping power comes from a single disc at front and drums brake at the rear wheel. The NTorq gets 12-inch alloy wheels at both wheels with tubeless tyres. A single disc brake at the front wheel and drum brake at the back handles stopping duty on NTorq. The damping responsibilities on the scooter were taken care by telescopic front forks and hydraulic coil spring shock absorbers at the rear. The remaining Honda Grazia features different size wheels as like the Burgman Street. The 12-inch alloy at the front and 10-inch unit at the rear. The wheels are wrapped up with the tubeless tyres. As for the front wheel, the company is giving an aid of selection from a disc and a drum brake. While the rear gets drum unit as standard fitment. The telescopic front forks and spring loaded hydraulic type rear shock absorbers completes suspension setup for the Grazia. All the three scooters in comparison boast of the similar 124cc single cylinder, air-cooled, four-stroke engine which comes mated to a CVT unit. However, there is a slight difference in generated power and developed torque. The 2018 Suzuki Burgman which uses powertrain shared from its brother Access 125 gets the peak power around 8.7 bhp at 7,000 rpm and the maximum torque of 10.2 Nm at 5,000 rpm. The engine unit with almost similar mechanicals and engine displacement makes out 8.52bhp at 6500 rpm and 10.54Nm at 5,000 rpm on the Honda Grazia. While, the TVS NTorq gets propelling power from a new CVT-REVV 124.79 cc single-cylinder, 4-stroke, 3-valve, air-cooled SOHC engine that generates 9.3 bhp at 7,500 rpm and transmits 10.5 Nm of torque to the rear wheel. The introductory price for the Honda Grazia and the TVS Ntorq is INR 59,687 and INR 59,622 respectively. In comparison with uniquely styled Suzuki Burgman Street, both these are around INR 9,000 cheaper offerings. However, in order to purchase the top end variant of NTorq, one has to shell out INR 63,994. All the three scooters in comparison are well-equipped and feature-packed units. Even, the churned power from the powertrain of all three models is similar as they get a 125cc, single-cylinder, air-cooled engine with CVT unit. Now you can only decide as per the styling and be asking price. In terms of looks, the Burgman Street is exclusive of all three. However, it attracts more expensive of all price sticker. The TVS Ntorq is one for those who want a loaded with features and performance scooter. It is more accessible as compared to top end Grazia and generates more power on paper. Now the decision is all yours as it is a comparison based on spec on paper. How will they perform in the real world can’t say without testing these 125cc scooters? Mayank Kumar Sharma, despite being an Engineer in Information Technology, he always shows his keen interest in tools or parts that belongs to the machines like cars and motorcycles. An avid member of its own world, his research interest is in the area of automobiles that maximize his knowledge in the technological world. « OnePlus 6 vs Honor 10: Which One Best to Buy?